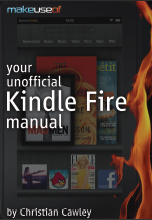 Introduction: What is the Kindle Fire? (Combining Android and Kindle, Differences between the Kindle Fire and Kindle, LCD vs E-Ink) - Setting up the Kindle Fire (Managing your Kindle Account, Buying books with the Kindle Fire, Finding free titles to read) - The Kindle Fire user interface (Menus, icons and gestures, browsing the newsstand, a focus on reading, reading books and documents, using search, removing books from your Kindle Fire, using the keyboard) - Installing and launching apps (installing new apps from the Amazon App Store, other ressources for installing Apps, launching and uninstalling Apps, suggested Apps for the Kindle Fire) - Music, video and Amazon Prime (What is Amazon Prime?, Syncing media to your Kindle Fire, playing music on your Kindle Fire, finding and downloading videos, advanced media player settings, I can't access Amazon Prime!) - Accessing the Web on your Kindle Fire (The Silk browser, Configuring the Silk browser) - Sending Email on the Kinfle Fire (Setting up, collecting and sending, Further Email settings) - Kindle Fire Settings and Connectivity (The Kindle Fire menu bar, battery management, configuring Wireless networking on the Kindle Fire, Display settings) - Kindle Fire Security (The lock screen password, credential storage, parental controls, changing the device owner and resetting your Kindle Fire, updating the Kindle Fire software) - Troubleshooting the Kindle Fire (Restart the device!, tracing and dealing with problem apps and games, dealing with synchronization issues, I've lost my password!) - Conclusion: Get reading!